I discovered silk painting while being the mommy helper for my daughter's Montessori class Mother's Day project and have been making dye run on silk ever since. In my teens I had learned to sew and over the years developed my own patterns. 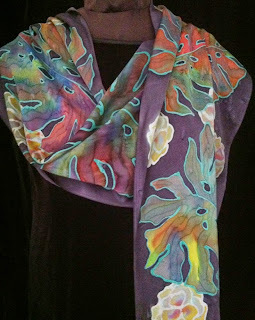 Silk painting let me create my own fabric patterns for a truly unique look when applied to my garment designs. Later in life, I learned about color and design by taking classes at my local junior college and tried my hand at drawing, sculpture, photography, textiles, metalwork, and pottery. I especially liked working in 3D but throughout continued to paint on silk at home. Now semi-retired, I pursue silk painting as my late-in-life career. 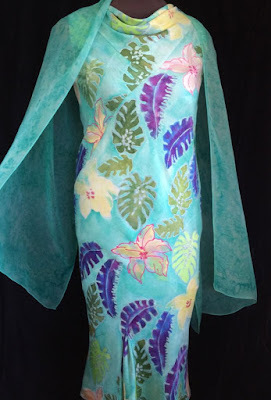 My silk motifs are largely drawn from nature and I often use tropical themes such as hibiscus, plumeria, banana leaf and monstera in in my work. My favorite subject is still the ginkgo leaf - it has such a pleasant shape and lends itself to any color palette I choose. 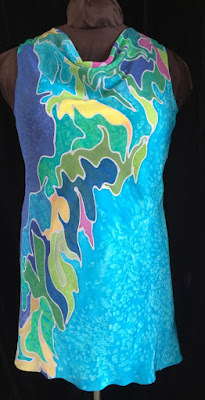 When I work on silk I like to use a relatively large motif then use a variety of silk painting techniques to create a texture within the shapes. 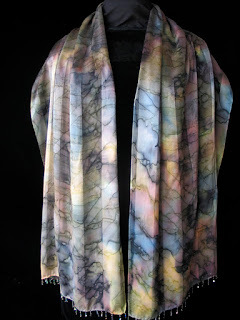 You can custom order a garment, scarf or wall hanging - no two are exactly alike since all artwork is drawn by hand and dye is applied with a brush. To the right is my Mother-of-the-Bride dress with Daughter-of-the-Bride dress - two variations on my ginkgo theme. I now also do plein air silk paintings, mostly at the beach! If I don't care for the result, I combine pieces into clothing. I also like to teach classes at my studio in Santa Cruz and limit class size to 3 beginner or 4 intermediate painters. I also like to travel and teach classes in other silk studios, so ask me! Non-artists will become artists! The Ultimate Scarf Tying Guide by Texere Silk shows 37ways to tie a scarf. If you click on any illustration, you will get step-by-step instructions on how to tie that scarf.